“Your schooldays should be the best days of your life.” Or so the cliché runs. Whilst this is true for some, it is unfair to hustle children of every upbringing, character and confidence under this archaic, leaking umbrella. It is inconceivable that a teacher, in charge of even a relatively small class of 15, is able to engage and communicate with each child on a level that adequately fulfils the requirements of their individual sensitivities. A factual education is one thing; a moral, formative education is quite another, and invariably, when the latter is lacking, the former suffers for it. There is simply no substitute for the depth of personal and intellectual understanding achieved through one-on-one tuition. Historically, British schools have marketed their services (and justified their fees) as not just an education, but “an all-round experience.” Contrary to the notion of inclusivity this strapline assumes, it is impossible for even the most pre-eminent institutions to incorporate a degree of inclusivity that covers the immeasurably broad spectrum of talent and aptitude they attract. Children who struggle with concentration and learning difficulties are too often left behind in a confusion of outdated truisms, to negotiate the rough-and-tumble of school life. Beside the undivided attention a tutor provides, their intrinsic advantage lies in their adaptability to their pupil’s unique requirements. While at school, the teacher is a slave to the syllabus and its deadlines, a tutor’s job is to manipulate the timing and intensity of delivery to suit the individual’s academic prowess. What’s more, the constraints of the school curriculum are no longer a consideration, and so the issue of limited contact/lesson time is alleviated. A tutor means flexibility in every department. Regency Tuition is a prestigious, London-based tuition agency that boasts a team of Oxbridge graduates, and offers one-on-one and online tuition. Visit the website here, and receive a free first session with the code SPRING2018. Adequate and flexible seating solution for your child/children and their tutor. 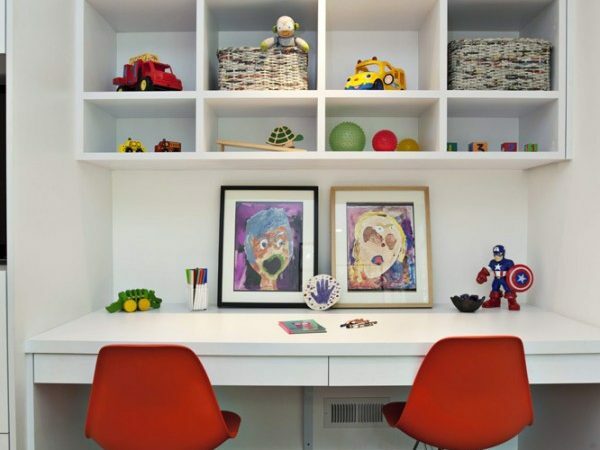 Create a specific room or zone for studying and home schooling, to avoid distractions. Make use of natural light, however install good lighting for working during the winter nights. Accessible open and closed storage for books and resources, to avoid clutter.